Billy Elliot: The Musical. Photo by Kyle Froman. I’ll keep this simple. If you haven’t seen Billy Elliot: The Musical, you must get down to the Ordway and catch part of the limited run through October 14. 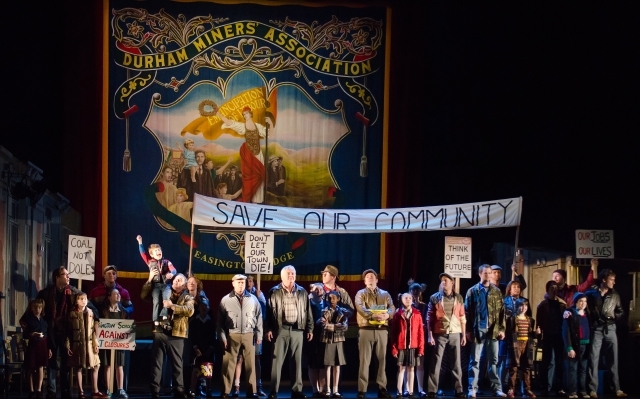 Beginning on the eve of the Miners’ Strike of 1984 in Northern England, Billy Elliot tells the heartwarming story of a young boy trying to find his passion during difficult times. When Billy stumbles into a ballet class after his dreadful boxing class, he realizes that he has a natural talent for ballet. With the help of his teacher, Mrs. Wilkinson, he lands an audition for the Royal Ballet, but his miner father refuses to let him go because he’s afraid of Billy being interested in a “sissy” pastime. Finally realizing that Billy’s talent can get him out of their dying community, Billy’s father raises money and takes him to the audition, where Billy’s passion lands him a spot with the company. What makes this simple plot seem more complex is the underlying sense of fear present for each character. The fear surrounding the strike is made evident through sharply choreographed police brutality, complete with sound effects that send shivers up one’s spine. Some scenes reminded me of recent episodes of police brutality during the Republican National Convention and the Occupy movement. Though the situations in Billy Elliot are theatrically staged, the feelings of fear and government control resonated. I couldn’t help but consider how similar Billy’s story was to the story of the young boys who performed in the musical. With their Broadway careers beginning before they can even drive, there isn’t time to simply be a kid amid blocking rehearsals, choreography sessions, dialect lessons, and vocal training. While our society is more accepting of male actors and dancers, young boys sometimes still fall victim to taunts and teasing for choosing to participate in a more creative activity over sports. Like Billy, these young performers have chosen to focus on their artistic careers—careers that are obviously blooming tremendously. I am still astounded by Noah Parets’s ability to carry the show as the title character. Even the responsibility of having the lead role couldn’t weigh him down; this thirteen-year-old sang and danced his heart out. Another strong young man, Jake Kitchin, easily stood out as a star as Michael, Billy’s quirky friend who encourages him to express himself. Finally, the chorus of young ballet girls was absolutely hilarious, perfectly depicting the awkward pre-teen years through squeals and squawks. It’s difficult to point out highlights from such an amazing show, but the moments where Billy is dancing made the show worth every penny. When young Parets began to dance, time stood still, and the world faded away. Talent like his is not seen every day, especially from such a young performer. Billy’s journey to find himself during social and political upheaval is joyful and triumphant, and this musical experience is one that doesn’t just entertain. It inspires and uplifts. Billy Elliot: The Musical is based on the Universal Pictures/Studio Canal Film, with music by Elton John. 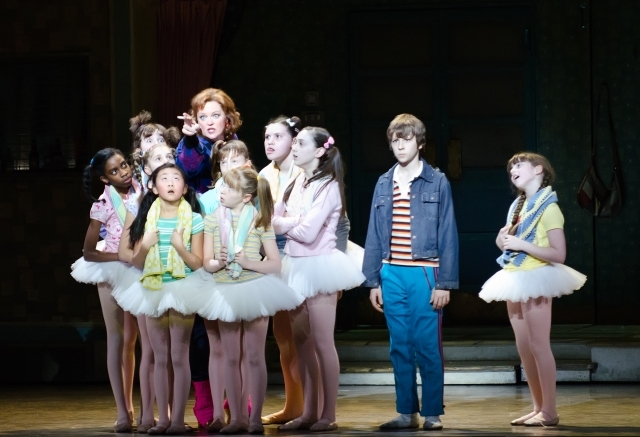 Billy Elliot will be at the Ordway through October 14. For more information, visit www.ordway.org. This ‘Billy Elliot’ is on its last legs. I have seen the show three times previously; the fourth time I expected the performance to be of the same caliber, but it was not to be. I was fortunate to see Lex Ishimoto as ‘Billy’, in two brilliant performances. The third time, ‘Billy’ was played by a boy who was ‘aging out’ of the part. Last night’s ‘Billy’ was played by Ben Cook, who, at 14, is aging out of the part as well. Ben is too big to play the part anymore. is an unintelligible ‘growl’. And he delivers his lines so fast, he’s stepping on his own potential laughs. This entire cast needs some discipline! The dialect for most of the performance was unintelligible, and it’s not because I don’t have an ‘ear’ for it; the previous three times I’ve seen it, everyone was perfectly understandable. The little ballet girls are mediocre; they have one reaction to everything, and that is to shriek. And now, cast members have been adding their own little ‘shtick’, to get themselves noticed for a few seconds longer. The miner who does the bit with pouring the salt, then stuffs the whole sandwich in his mouth, overplays it, and misses most of the humor of the bit. Policemen have now added ‘picking their noses’…… just not funny, although they look like ‘they’ think they’re hysterical. Other little bits of hamming-it-up aren’t funny, they’re simply annoying. when it came to the ensemble tap dancing, forget about it; a mess. Even the younger Billy-older Billy ballet, which at three previous viewings brought tears to my eyes, was uninspiring, but that looked to be Ben Cook’s fault; the man dancing the older Billy part was excellent; Ben Cook, dancing the younger Billy, was out of sync with the older Billy for most of the dance. Even the follow-spot operators were out of it for this number, leaving one Billy or the other in darkness. This production has been cut down from the previous touring show. It used to be a three-truck show and is now a one-truck show…… it shows. The saving grace was the orchestra. Excellent and enthusiastic players and performance. I know it’s hard to keep a show ‘fresh’ when it’s been on the road for so long, but that ‘is’ the production people and the cast’s ‘job’! If ‘I’ were the production manager, I’d call a rehearsal at 10am!